I argue for sweeping core improvements like Green Line Heavy Rail because I do see getting even one big thing done setting off a domino effect of improvements in the wake of having finally overcome everything acting to oppose improvement. I don't think Red-Blue or Blue to Lynn would have any real problems getting off the ground in the wake of such a huge undertaking, and once you start building on Blue why stop? Knock both of those out as part of the same project, and then Blue Line to Waltham/Orange Line to Reading stops looking so crazy. That having been said, nothing can happen until we start with something. I like the idea of reducing the number of stops on non-D Green Line branches, and as long as we're consolidating stops, why not consolidate Reservoir/Cleveland Circle? They're close enough together that you'd really only need to build a larger station on top of the yard they have there now. You pick up a C-to-D connection, clear the way to keep that yard in use for both LRV and HRV Green Line stock, assuming that we can't convert all the branches. I'd also like to see a study assessing how doable B branch heavy rail is. I imagine it starts looking a whole lot better when you start axing stations? Grade separating the "B" is too expensive. Cut-n-cover might be worthwhile up to Harvard Ave, especially when they redo Comm Ave, but what do you do beyond that? Elevate? That'll go over well. Really, there's nothing wrong with light rail when run properly. That means signal priority and proper boarding procedures. I also don't understand why you would want to do a relatively easy extension (Lynn) after an extremely difficult conversion ("B"). I don't know what you mean by consolidating Cleveland Circle and Reservoir. What for? The stations are really not that far apart. They could use some improvements for pedestrians there anyhow. The stations are really not that far apart. They could use some improvements for pedestrians there anyhow. That's the point. You can combine them. Elevating the the B line until the hill after Warren Street would be pretty easy in conjunction with the major Comm Ave overhaul. Carriageways could be used to divert traffic during construction and the current rail line would be able to operate during construction as they build the elevated line in the center of the right-of-way. 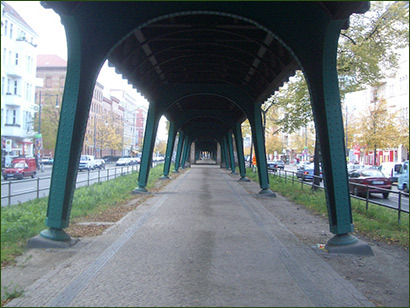 Create a bike path and green space underneath and along the line and we'd have a very nice corridor going. This looks good. I would actually move BU west to the intersection with Mountfort / BU Bridge so that it's easier to transfer to the CT2/47. As long as we're talking about extending the tunnel from Kenmore to Harvard Ave on the "B", why not cut and cover Brighton Ave, Cambridge St and Washington St to give us back an "A" branch to Oak Square? Hell depending on ambitions, bring it all the way to Watertown Sq. So here's a map of rapid transit rail projects that in my opinion are "reasonable"
Green Line: Signal Priority; All-door boarding; Stop Consolidation; Extension to Rte 16 via Lowell Line; Extension to Porter Square via Fitchburg Line; Restoration of "E" to Forest Hills; "A" branch to Oak Square; Branch to Needham Junction via "D"
Indigo: DMU South Station to Westwood. Possibly similar DMU routes to Riverside on Worcester Line and to Cedarwood on Fitchburg Line. Omaja -- you are using the wrong metric. The average density of the town or city is not relevant. Boarding numbers on the Blue Line in Orient Heighs is totally decoupled from the near suburban density in West Roxbury. What matters is some combination of linear density along the line (and a few blocks away) and some parking for the non-walk/bike-up commuters + the people making the reverse commute. Thus while Arlington as a whole is not dense enoungh for a Light Rail line by the book -- the LR-like frequency Mass Ave. #77 Bus is full most of the time when it leaves Cambridge. All along Mass Ave. there are multi-storey appartments providing urban levels of density for a couple of blocks on either side of the bus route. In addition, the Tech Cores along Rt-128 in Waltham, Lexington and Burligton expected to result from thus new initiative on the part of the various developers will provide not just clusters of commuters, but also clusters of employment and shopping. You have been warned again!! Whigh, you're proving my point. Density and demand exist along the Mass Ave corridor for service to Cambridge and Boston. Conversely, neither the density nor the demand exist for service between Waltham-Lexington-Burlington. Average density does matter considering these are suburbs, after all, where density tends to be lower and more uniform. Start with service to the inner Boston area and you might see more demand develop for intra-suburban travel. Until then, though, intra-suburban rail will be one of the craziest pitches in my book. I raised the issue of the B branch more as a curiosity piece, and while I think CBTC will do a lot to solve the problems with the Green Line west of the split, I don't see CBTC solving the problems east of Kenmore. When I drafted the crazy pitch for a Heavy Rail conversion, I sent it down the D branch but prioritized every other part of the project first for a reason. Converting the Green Line but not any of its branches to Heavy Rail would just create a severe headache at Kenmore that's worse than the current one plus all the headaches Park Street to North Station at Rush Hour combined. It's been mentioned before as well that despite the great ROW on D, D is a lesser choice for conversion than B or C would be. So I had to ask. Well that's the problem with this thread isn't it? We all will have different definitions of "reasonable" and "crazy", which are after all, subjective terms. I think the best use of this thread is to hash out the logistics and feasibility of transit pitches, instead of calling people out saying "that's not reasonable!"